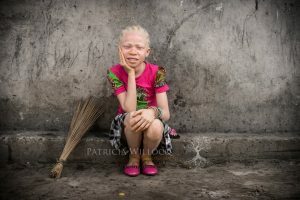 Photographer Patricia Willocq was raised in the Democratic Republic of Congo, where people with albinism are often the target of discrimination that, in the worst cases, endangers their very livelihood. She recalls, from a young age, recognizing the injustices people living with albinism were forced to endure, and feeling compelled to do something about it. Albinism is a congenital condition, affecting individuals of all ethnicities and genders, in which a person is unable to produce the typical pigmentation of skin, hair and eyes, resulting in extremely fair complexion and sensitivity to light. 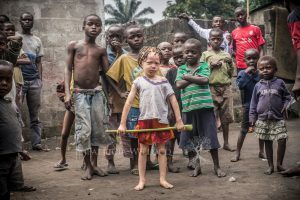 In certain parts of Africa, including the DRC, people with albinism are subjected to extreme prejudice and acts of violence, stemming from superstitious beliefs with no factual basis. Women who give birth to children with albinism are often abandoned by their partners as a result. Their children are often unjustly assumed to be “less than” because of the color of their skin. “They are rejected, stigmatized and taken out of school, which diminishes their chance of future integration into society,” Willocq said. As a result, many people with albinism grow up in poverty, without access to the resources and educational opportunities of their peers. 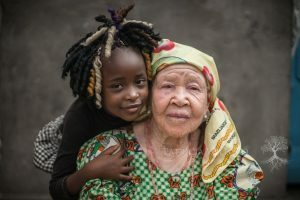 Some healers and “witch doctors” in Africa have perpetuated the false notion that those with albinism possess magical powers, resulting in a haunting demand for their human body parts to be used in amulets or potions. “This has led to attacks, abductions and killings of people with albinism, and even to the theft of their bodies from graveyards,” United Nations Secretary-General Ban Ki-moon said earlier this month. 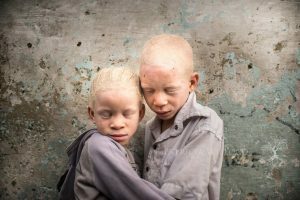 In 2013, Willocq returned to the Democratic Republic of Congo, camera in tow, determined to dispel the dangerous misinformation surrounding albinism. 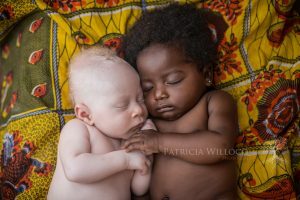 She embarked on a photo essay entitled “Black Ebony,” capturing the overwhelming beauty of babies, children and adults living with albinism. The photographs communicate what words cannot grasp, the blessing that is difference and the humanity that unites us all.